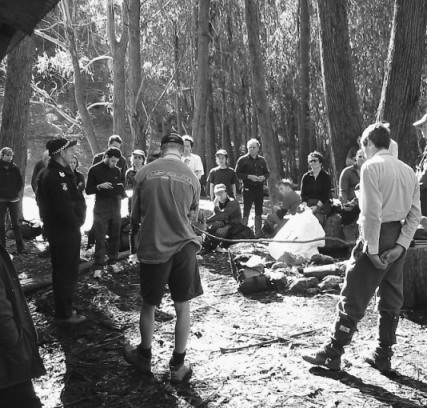 There are many groups, both volunteer and government, involved in aspects of search and rescue so it is understandable that the public and the news media are sometimes confused about who carries the final responsibility. An agreement between the Commonwealth and the States in 1962 made it clear that Police are responsible for all searches on land and coastal waters. Bush Search and Rescue assists Victoria Police and responds only to requests for help from them. 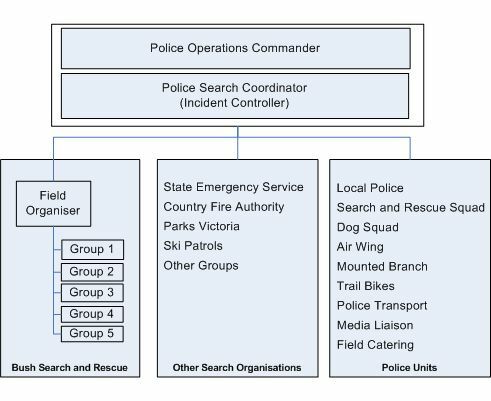 In the field, Bush Search and Rescue’s contribution to a search is controlled by a Field Organiser, who reports directly to Police. The FO may appoint assistants and will usually organise searchers into groups of four, including an experienced Group Leader. On a large and complex search, the FO may use other FOs to control several groups. A typical field organisation is illustrated in Figure 3.2. The roles and detailed duties of FOs, Group Leaders and searchers are in Search Organisation.